The Working Party who are responsible for the organisation of the fair consists of 6 people! The Fair requires a huge number of volunteers to make it work, over 100 on Fair day itself. Think 'Games Makers' at the Olympics! Would you like to be part of the M.A.G.I.C of Bampton Charter Fair? Could you spare an hour or more (at a time to suit you!) to volunteer to be a Champion on Bampton’s Special Day? M.A.G.I.C are a dedicated and friendly bunch of people who welcome visitors to OUR town and OUR annual Fair. 2017 Stewards' Meeting and Training Mon. 23rd Oct. 2.00pm or Tues 24th. 7pm - Riverside Hall. Our M.A.G.I.C team work in pairs in one or two hour time-slots throughout the day. You will be given training beforehand about all aspects of the Fair, and will be able to contact a central control room in case of any difficulty. 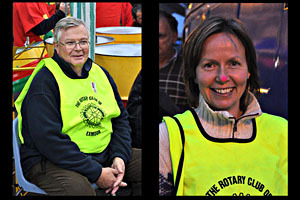 A yellow tabard will identify you as a member of the MAGIC team - these are now special ones with the Fair logo on them. At a later date, and by way of a Big Thank You, our “Magicians” are treated to a “Magic Moments” evening with buffet and refreshments. We hope you’re inspired and interested in finding out more about this very important role as part of The Bampton Charter Fair. We can't do it without you.